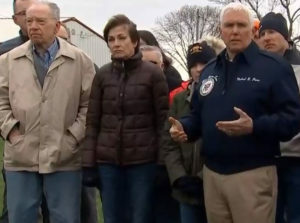 Vice President Mike Pence today said it’s time for congress “to put politics aside” and approve a disaster aid package that includes money for Midwestern flooding. Iowa Republican Joni Ernst was among a group of U.S. Senatros who met with President Trump Thursday about the negotiations. Pence toured a farm southwest of Pacific Junction that was hit by last month’s flooding. He also took an aerial tour of the flooding. 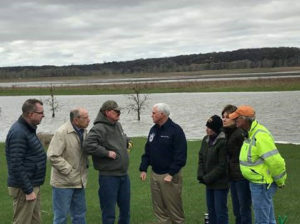 Next Wednesday, Senator Ernst will convene a hearing in Glenwood to discuss U.S. Army Corp of Engineers management of the Missouri River.